Penguins as Santa's little helpers? Everyone can agree this fun design of penguins clad in Santa hats and having a grand ole time up in the North Pole is absolutely adorable. 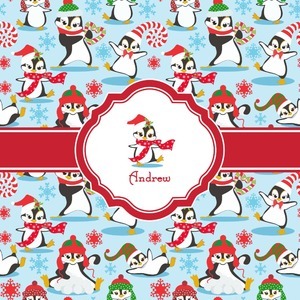 The ribbon and label are red, and the label includes a little penguin, ready for the holidays, along with your name or text for personalization.